Often referred to as the “Father of Modern Artillery in Canada”, Charles William Drury maintained the interests of Canadian Gunners foremost throughout his life. Commissioned in January 1874at eighteen years of age in the New Brunswick Garrison Artillery Brigade at Saint John, hi aptitude for technical field artillery work and his ability to put this knowledge to work in a practical fashion was recognized immediately. As a Captain he served during the North-West Rebellion (1885) commanding the field division of “A” Battery Royal Canadian Artillery (RCA). His unflagging efforts to introduce indirect fire techniques despite the inherent unsuitability of his equipment was a clear indication of his progressive thinking. For his splendid work and constant vigilance during this campaign he was Mentioned-in-Dispatches. As a junior officer he fully appreciated the difficulties of winter mobility experienced by the field artillery. His innovative and practical design for field gun and ammunition sleighs allowed identical “Into Action” drills in both winter and summer. At the time of the Permanent Artillery re-organization in 1893, General Drury, then a lieutenant-Colonel, was appointed to command “A” Battery, Royal Canadian Field Artillery at Kingston and simultaneously appointed Commandant of the Kingston-based Royal School of Artillery. In 1893 he attended the opening of the Imperial Institute in London and while in England, studied the new system of fire discipline then us use by the British Army. Upon his return he lost no time in teaching the new system to his instructional staff in preparation for that winter’s courses and the annual training concentrations in the summer of 1894. This particular summer’s training activities incorporated General Drury’s realistic, moveable and automatically appearing targets, a system later adopted and used by cavalry and infantry. During the South African War Lieutenant-Colonel Drury was dispatched on special duty with the 1st Canadian Contingent and was appointed to command the Canadian Field Brigade of Artillery. As the nature of the war dictated the dispersal of artillery formations, he was appointed to command various mixed arm organizations. For his services in this theatre he was Mentioned-in-Dispatches and appointed Companion of The Most Honourable Order of the Bath. Throughout this campaign the experiences of this practical and technically proficient gunner fostered many innovations. He recognized the need to increase the lethality of artillery ammunition and the requirement to develop smokeless propellants as an aid to concealment. He advocated the deployment of artillery behind cover or on reverse slopes where the gunners could work unobserved and unimpeded by enemy actions. He believed that indirect fire should become the artillery’s normal method of deployment. On his return to Canada the adoption of these improvements remained his constant goal. 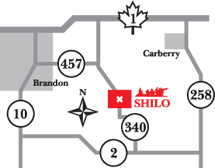 In April 1905 Colonel Drury was appointed to command Military District Number 6 at Halifax. The withdrawal of the British troops from Halifax was a politically sensitive matter and his steady hand was needed at the helm. 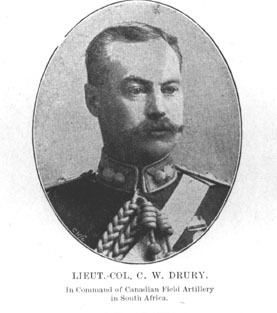 Colonel Drury was promoted to Major-General in June 1912 and sadly, less than one year later at the age of fifty-seven, Canada lost of its ablest gunners. Two years later officers of his competence and enthusiasm would sorely be needed during the Great War.